April is Autism Awareness Month and Illegal Pete's is getting involved. 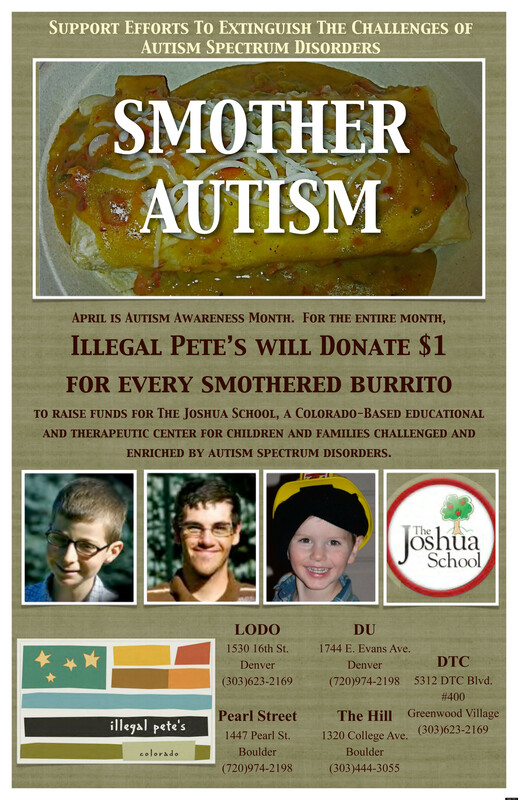 The Colorado burrito restaurant has announced a new campaign called "Smother Autism" to help raise funding for The Joshua School, a Colorado-based, non-profit educational therapeutic day treatment center for children with an autism spectrum disorder and related developmental disabilities, according to the school's website. All money raised by Illegal Pete's will go toward The Joshua School's newly announced Boulder campus. Throughout the month of April, Illegal Pete's is giving customers the chance to donate in three ways: Illegal Pete's will automatically donate $1 to The Joshua School every time a customer smothers their burrito. Customers can also donate $1 directly in exchange for a leaf that can be signed and displayed in support of the campaign. Customers using "Pete's Mobile," Illegal Pete's mobile ordering app, can also round up the cost of their order as a straight donation to The Joshua School. Later in the month, Illegal Pete's will also be hosting two benefit concerts at their University of Denver location on Evans Ave. First, on Saturday, April 14 at 8 p.m. Illegal Pete's DU will host a concert featuring the music of Days of Rae and Robert Harrison with $15 all you can drink Coors Light and $25 all you can drink Odell's. Then on Thursday, April 26 at 9 p.m., a second show at the DU location will feature live music from The Epilogues. According to a new report from the Centers for Disease Control and Prevention, one in 88 U.S. children has an autism spectrum disorder. That's a 23 percent increase in prevalence from the previous autism report from 2009 which estimated that autism affected one in 110 children and it's nearly double the rate that was reported ten years ago, Reuters reports. Visit The Joshua School's website or Illegal Pete's website for more information.